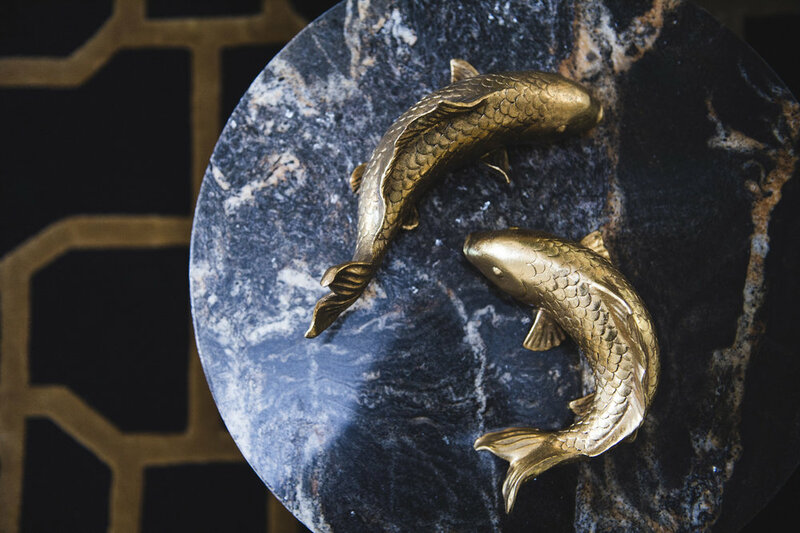 This West London Victorian Grade II–listed home combines old-school glamour and hotel luxe. 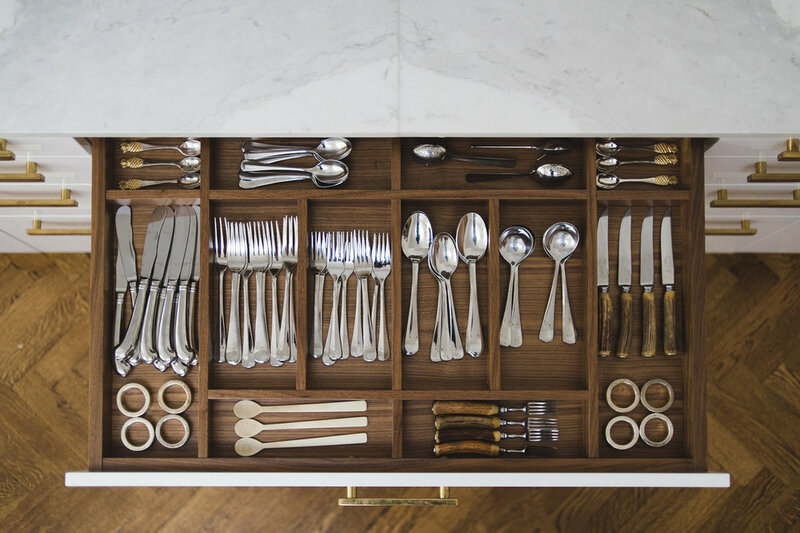 Featured in Architectural Digest online November, 2016. 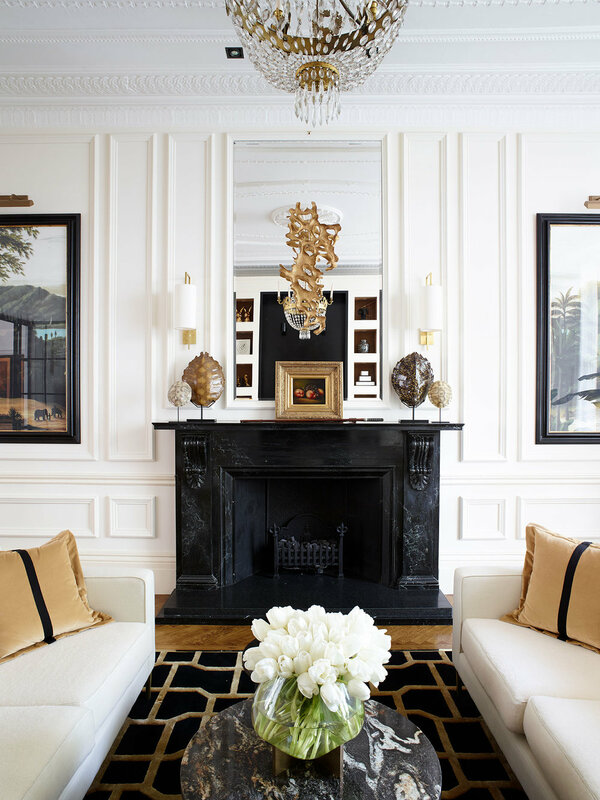 Lynn restored the original plasterwork in this well-proportioned space and hung a French Empire tent chandelier for added impact. The sofas, upholstered in alpaca and linen, were custom made by Elspeth Lynn Design. 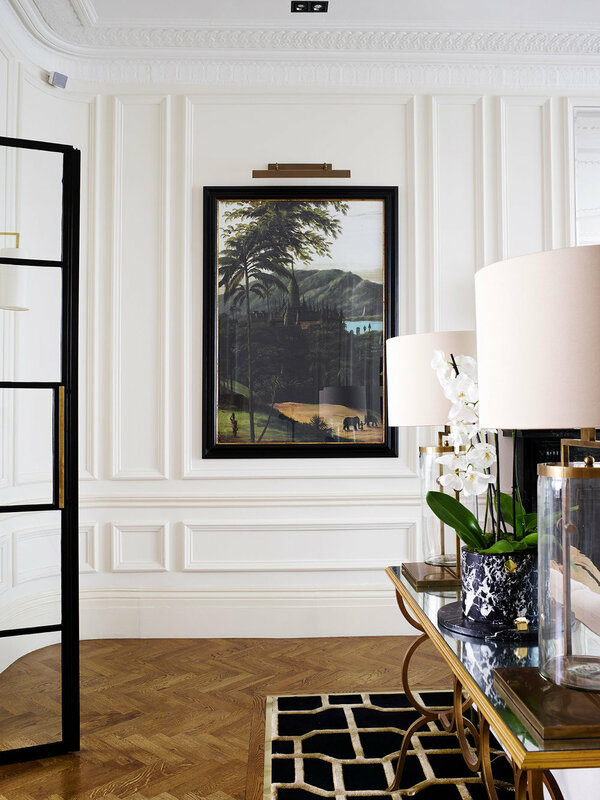 A striking black-lacquered workstation creates a dramatic focal point in the living room. The custom-made black-and-caramel piped-velvet chair was produced by Bojan Bojanov at Unique Home. Built-in alcoves on either side display favorite objets, while concealed cupboards house paperwork. Steel-and-glass doors by Clement bring a softly industrial feel to this period setting, while a decorative console from Jonathan Charles adds an Art Deco touch. Every sight line was considered. It’s a real luxury if every view is a beautiful one. Custom coloured inlaid black and bronze Stark carpet with brass trim. The curved black banquette piped in cream was custom made to Lynn’s specifications by designer Raj Sharma. Tom Dixon’s Mirror Ball pendant lights add sheen, while Jonathan Adler’s Nixon alpaca throws introduce a luxurious note. Built in Miele Nespresso coffee machine for brilliant coffee every time. 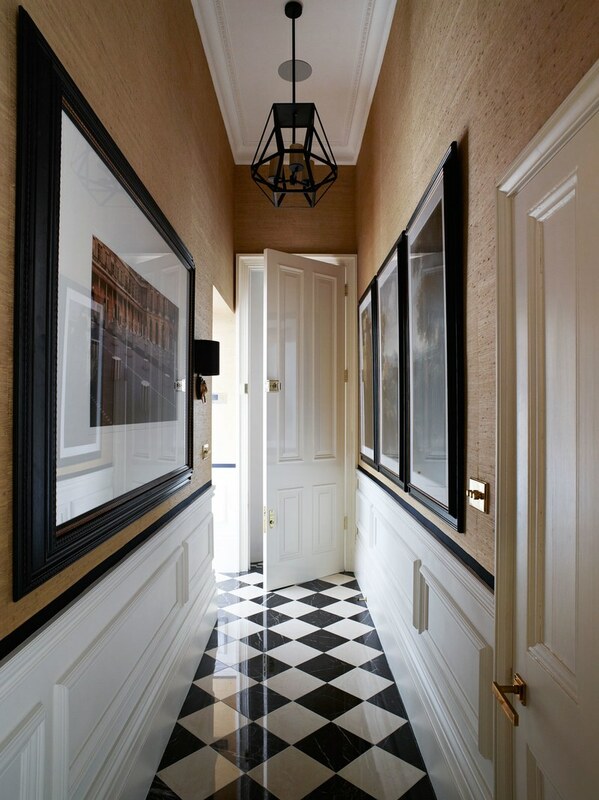 Black-and-white checkerboard flooring sets an elegant tone in the hallway. 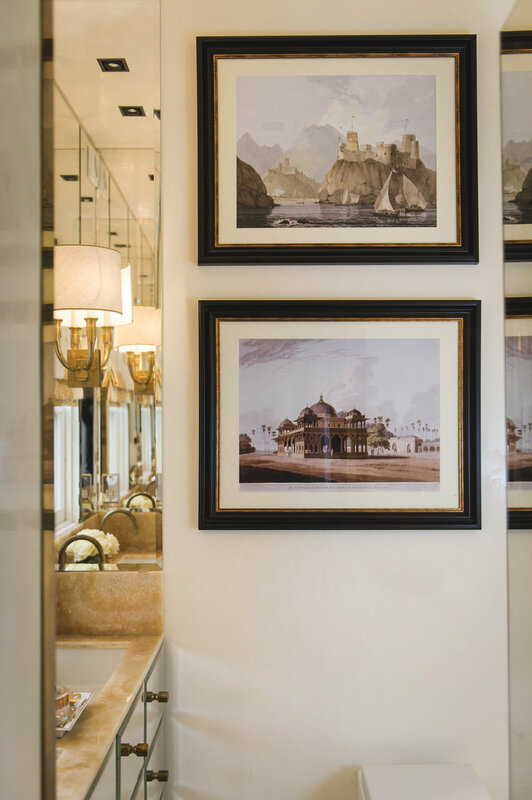 Vaughan’s Lion Head wall lights add a hint of glamour, while a black metal pendant introduces a graphic note.Walls are lined with Pearl River Jute from Thibaut’s Grasscloth collection. A vintage 1950s wall rack sourced from Valerie Wade is the perfect receptacle for coats. To create contrast and add an Art Deco touch, the jute wallpaper was edged in wide black grosgrain ribbon by VV Rouleaux. The quietest of master bedrooms so you can geta peaceful night’s rest. And feel good every morning. 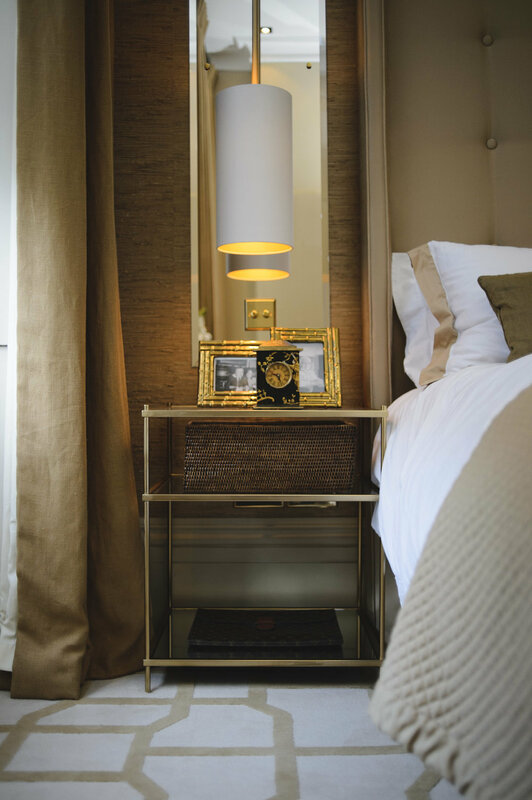 A bespoke silk-upholstered headboard is set off by a pair of slim mirrored panels on either side of the bed. 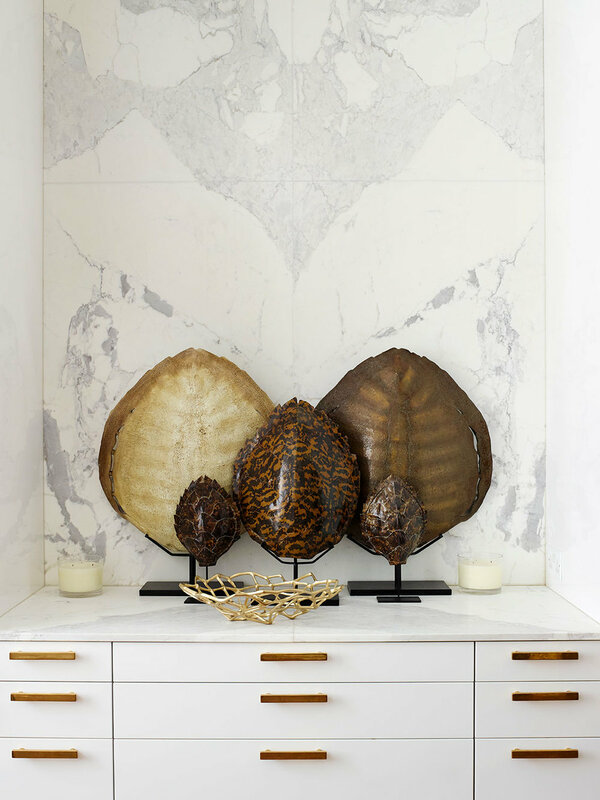 The pendant lamps were custom made by lighting studio Villaverde, while walls lined in Thibaut’s Rush Cloth create a cocooning effect. Inspired by her favorite London hotels, the master bedroom combines functionality and old-school glamour with a palette of restful caramels and golds. 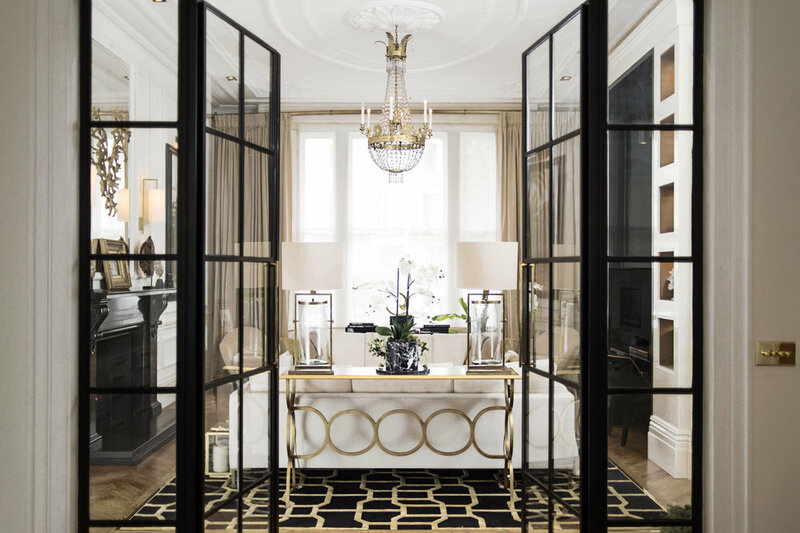 A partially mirrored wall divider acts as a handy storage and dressing area. Plenty of texture enhances this gold-and-caramel scheme, from the diamond-embossed wool sisal carpet by Stark to the tropical-print duvet cover from Zara Home. Rafia wallpaper, thick drapes, and a generous headboard make this an inviting escape. A bathroom designed so you can luxuriate in the bath for hours.A deep tub with a striking Calacatta marble surround, contrasted with jet-black fittings by Watermark. Walls in custom Venetian plaster. A powder room was conjured from an under-stairs cupboard, and the layout was reconfigured to allow for generous storage. Powder room vanity and sink in Honey Onyx marble, taps by Waterworks N.Y.